There are a number of differences going on here: different graphics, different level layouts, audio differences, text differences, debug controls, glitches, and other changes are present. 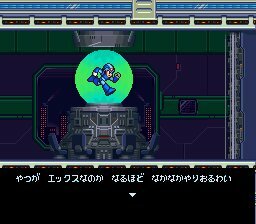 One neat difference I'd like to point out is the Irregular select screen has the "X" icon with DATA written beneath it, just like in the Rockman X2 manual. The grey tower is also labeled as "I.H", indicating that this building is, and always has been, Irregular Hunter HQ. Neat! Check out the TCRF page here for more differences. Hit the jump below for download instructions! You can download this prototype (and lots of other prototypes, sample versions, etc.) from the green "Betas & Protos" button on the right side of the blog. 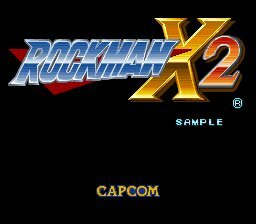 The file is "Rockman X2 Sample.rar". You might need to try a few alternatives to get it to run properly. Everyone's done all they can with this one. is there any major differences in here? The SD2SNES would freeze with the unmodified ROM, but works fine with the modified ROM. Running on the Analogue Super Nt. It's exciting to see the TCRF article about this new discovered prototype! 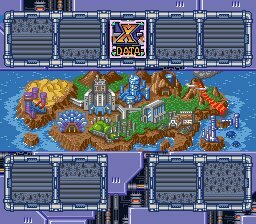 Snes9x on PSP won't even load main HUD and graphics of X, but Snes9x ver 1.51 rerecording v7 (win32) mostly fine except the CX4 wireframe objects in action (Chop Register/Sigma Virus) unseen but hitbox still intact. How about some photos of the PCB? Incredible, played it earlier and really enjoyed it! Thank you so much to everyone involved for preserving this! Why? So you can hoard it for it to never be seen again like most beta collectors? 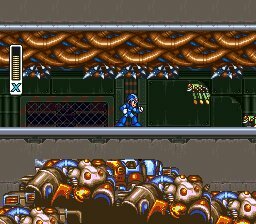 Im playing this on SNES9XGX emulator on the wii and it has one big problem with bubble crab's stage. 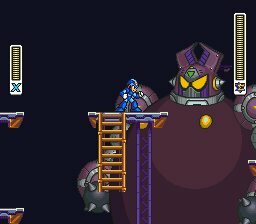 The mid boss will be out of place and the metallic bridge wont open. Not at the moment. Working on it.